In my experience, drugstore makeup products usually get the job done. I have found plenty of Maybelline or Revlon foundations that I use regularly. I stopped at Walmart over the weekend to pick up a lighter shade of Maybelline's Fit Me Matte + Poreless (which I'll review soon). As I perused the makeup aisle, Hard Candy's display caught my eye, and I grabbed a bottle of their Glamoflauge foundation. It looked decent, I liked the description, and the color didn't seem either too yellow or too orange. In the end, I wasted $7. It's true that the shade wasn't too yellow or orange, but that's only because it was unnaturally white on my skin. As a general rule, I wear the lightest shade of drugstore brand foundation. And I still don't know that a darker shade of this product would have been any better. It lacked dimension and, as I said, it was just a very unnatural color. As for the texture, let's just say that it wasn't glamoflauging anything. My skin has actually been very well moisturized lately (thanks in large part to my still-favorite moisturizer), but with this foundation on, my face looked dry and flaky. Normally with a foundation misstep, I can blend in other products and come away looking okay, but I had to completely restart with this one. Wash my face and begin again. 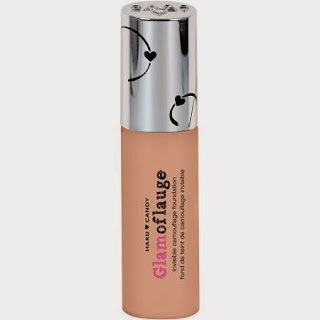 I want to experiment with mixing this with a too-dark tinted moisturizer I have to see if I can balance out the color and texture problems, but if that fails this might be the first time I throw a full bottle of foundation into the trash. FWIW, I asked my sister to give the foundation a try, because there is a surprising number of positive reviews out there. She liked it better than I did, thought it provided good coverage, but also agreed that the color was a bit too light. She thought it was difficult to apply because the consistency was "like paint," but that once she got it on it was okay. Have you tried Hard Candy? Did you have a different experience from mine?